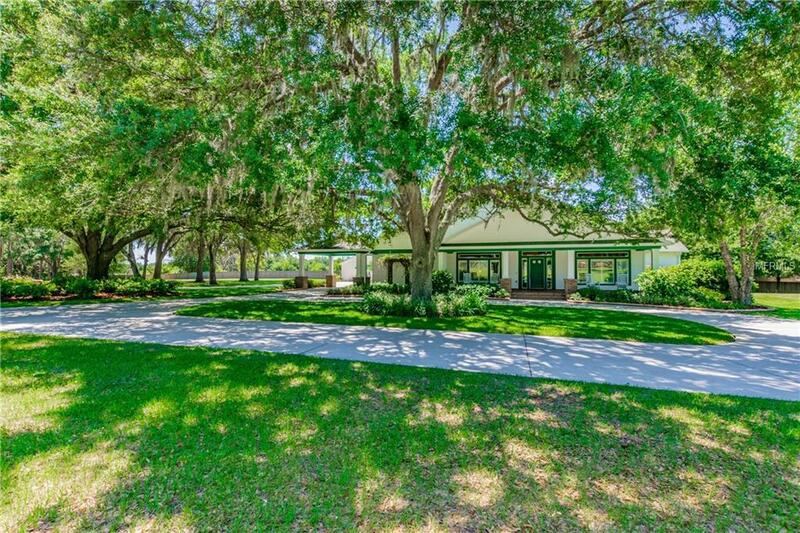 Majestic oaks shade the private drive as you drive along the front fenced pasture. Come up to the circular drive and view this Traditional Country Home. Brick entry covered porch and porte cochere give a hint of what is to come. Fine details from wide plank wood flooring, Crown molding throughout, detailed columns separating the living room/dining room. Dining has chair rail and bead board wainscoting. Notice the stained bead board ceiling down the hall to the kitchen and family room. New Granite counter tops being installed. Oak cabinets with traditional handles on the built in refrigerator, unique brick backsplash with squish layer mortar all overlooking the brick fireplace and French doors to the brick covered patio and private pool. The master suite is truly a suite with a large sitting room with plenty of light and awnings and shutters. The bath has a walk in shower, large spa tub with separate rinsing head, his/her separate sinks/cabinets. Cabinets with built in sliding drawers with electric. No details left behind. Separate building off the pool has a garage and large office/game room. Big firepit for parties, separate 3 acres behind also for sale. Big pasture beside for entertaining/weddings, etc. This high end, custom home is built for entertaining and tranquility. Transom windows throughout that let natural light into rooms with 9' ceilings. Surround sound and pantry has 2 doors- 1 to den and other has glass opening to kitchen. It is huge. Den looks out over front porch/pasture. Listing provided courtesy of First Quality Homes.